This berry muesli is inspired by a particular brand of muesli that my teenagers inhale at the rate of (almost) a box per day. As I make home-made muesli regularly, I checked out the ingredients to figure out why they liked this muesli more than my other muesli mixes. I believe it is the absence of nuts and coconut and the abundance of berries that make this muesli a hit. I have recreated the berry muesli using the ingredients on the box as a guide. 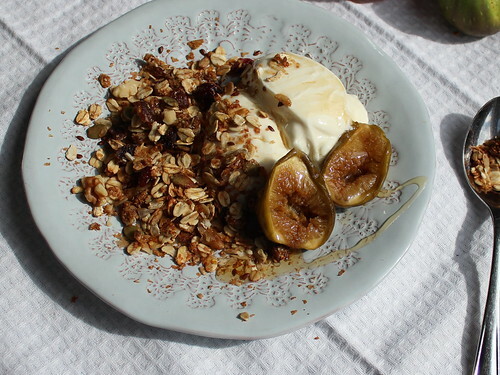 Each time I make the muesli it turns out a little bit different depending on my muesli ingredient stocks. 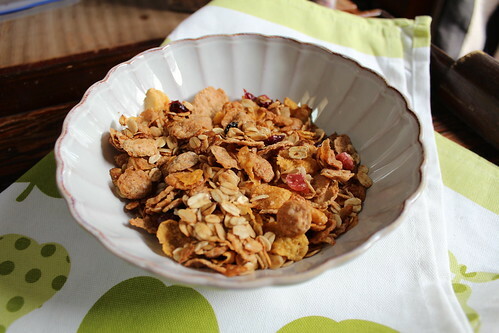 Cereal flakes can be a mix of Special K Original, Mesa Sunrise Flakes, Ancient Grain Flakes and Heritage Flakes which include flakes of rice, whole wheat, whole grain oats, corn, flake, quinoa, amaranth, barley & spelt. I buy whatever is on special. 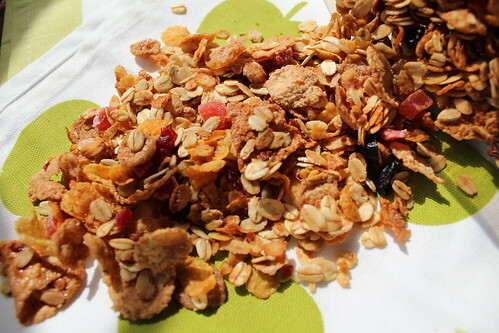 The muesli can be made with all Special K Original but I like the layering of flavours when the other flakes are included in the cereal. You could also use brown rice flakes and coconut flakes (although I purposely leave coconut out of this particular muesli mix as that is how the teens prefer it). By using some regular grains (wheat and oats) along with the more expensive grains (quinoa, amaranth etc) it balances out the cost. If budget is of less concern than health, use all organic, ancient, or heritage flakes. 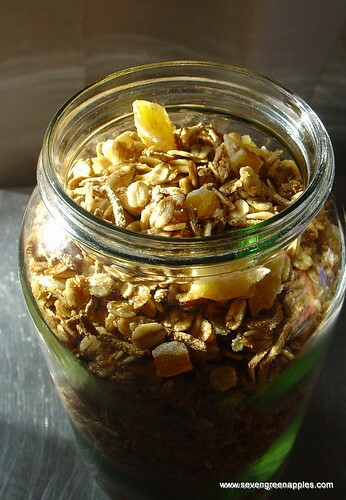 The natural bran flakes (these are similar to corn flakes but made from bran as opposed to these) can be substituted for bran sticks, or oat bran. I have used wheat bran flakes such as you would use in bran muffins but prefer the other type of bran flakes (like you find in Sultana Bran Cereal). I have linked through to the particular products I use, but you can use any brand you wish. The natural bran flakes I have been using (Sanitarium Fibre Life Bran Flakes) don’t appear to be available any longer (I am waiting on confirmation from Sanitarium on that) but I have found that our local Bulk Bins also sells bran flakes. 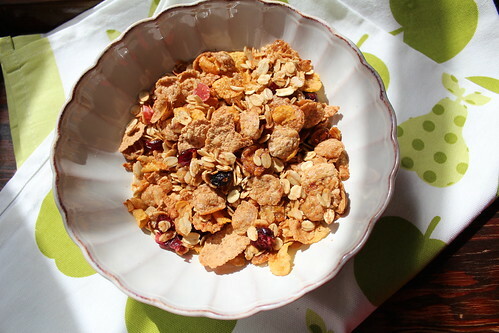 These appear to be the same sort of bran flakes as used in Sultana Bran – they are much larger than the Fibre Life ones. As for the berry syrup – I use Giffard strawberry syrup as I could by it locally. That is no longer the case so I will probably swap to a NZ made strawberry syrup such as this or a raspberry one such as this. However any berry flavoured syrup or cordial will work, blackcurrant is nice as is raspberry & rhubarb. If you haven’t any flavoured syrup, it is very easy to make (see here) or use honey or golden syrup. For the jam I use any berry flavoured jam, either mixed berry or a plain raspberry or boysenberry. I have also used plum jam and a grape jam I made that wasn’t appreciated as a toast topping. I increase this recipe by half again and it fills a 5 litre cereal container. Combine flakes & oats in a large roasting dish. Heat syrup, jam and oil until runny. Whisk to combine the ingredients then pour over the flakes. Mix thoroughly to make sure the syrup mixture coats all the dry ingredients. 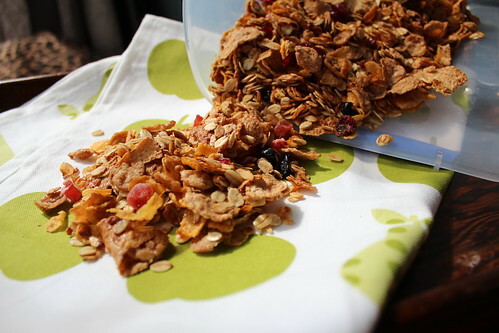 Bake, stirring several times, 20-30 minutes until the muesli is golden and smelling fragrant. Allow to cool, stirring several times to break up any clumps. Roughly chop the dried fruit. Stir in fruit and freeze-dried powder if using. NB: I have received no free product or compensation for any of the products mentioned in this post.